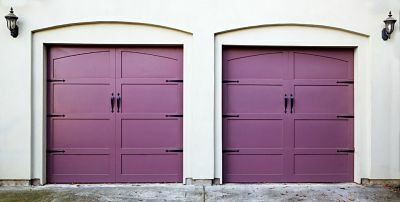 If your garage door is looking a bit tired and you’re still saving up for a brand new one, here are a few simple garage doors makeover tips to help you make it look newer or more interesting. If you have a garage door that already has a bit of texture in it, all you need are two different shades of brown paint and some old rags in order to make it look like wood. Firstly, paint the door with the lighter shade as the base. Once that’s dried, paint over with the darker paint, but as you’re applying it, rub it with the rags as you go along – only some of the darker paint will remain, giving it the illusion of texture. If your garage door is smooth, but you’d still like to have a go, there are plenty of online tutorials which show you how to create a wood grain effect from scratch. If you’ve always wanted the look of a carriage door, but only have a plain up and over one, a few bits and pieces of hardware and careful use of dark paint can produce a door that really looks like the old fashioned carriage doors. Once again, the internet will provide tips and tutorials from people who’ve already done it. There’s no reason why pergolas should be confined to the garden. As you arrive home from a long day at work, wouldn’t it bring a smile to your face to be greeted by the flowers creeping over a pergola above your garage? And it’ll also provide some much-needed shade on a hot summer’s day. Making a pergola isn’t quite as easy as being decorative with paints, but if you’ve got basic woodworking skills, you can definitely give it a go! Not all makeovers need to be difficult, take a long time or benefit from artistic ability! Simple hanging baskets placed at each side of the door can cheer it up immensely. Most garden centres sell them ready made, and you can even get them with winter flowers so you could have a splash of colour all year round. Don’t forget to water them! Obviously, if you think that DIY seems too much like hard work, or you’re not too sure that your results will be as good as those you see online, a brand new door would be your best (and easiest) option! Here is a list of a range of garage door styles and colours which are designed to suit every budget.